Originally written for the Vol.7-No.2 edition (October 18, 2013) of the Toyama Hot News e-newsletter. Trail running, with its way of allowing runners to sense the dirt and fallen leaves beneath their feet and to challenge themselves on hills, has recently been gaining popularity in Japan. On October 19 and 20, the Gokayama Doshumichi Trail Running Tour will be held on the historical trail between the temples of Gyotokuji in Gokayama and Zuisenji in Inami, all within Nanto City, Toyama Prefecture. The course is about 30km and runs through mountains roughly 1,000m (3,280 ft.) tall. The event is a preview of the Gokayama Doshumichi Trail Race (tentative name) that will be held in October 2014 as part of the celebration events commemorating the 10th anniversary of Nanto City’s incorporation. Doshumichi is an old path that is said to have been used for many years by Akao Doshu (1462 – 1516), the founder of Gyotokuji Temple and a disciple of Rennyo, in order to study at Zuisenji Temple. The trail passes through many mountain ridges. A local group called “Doshumichi-no-kai” researched this road and began maintaining the trail about five years ago, clearing the overgrown path and installing approximately sixty signposts. The Trail Running Tour begins at Gyotokuji, enters the trailhead by the World Heritage Village of Suganuma in Gokayama, runs along mountain ridges, and then arrives in Inami, an area known for its tradition in woodcarving. Along this “backbone of Nanto City” there is a marker for the geographical center of the city. The trail also passes through beautiful beech forests, and if they are lucky, runners will be able to enjoy autumn colors. 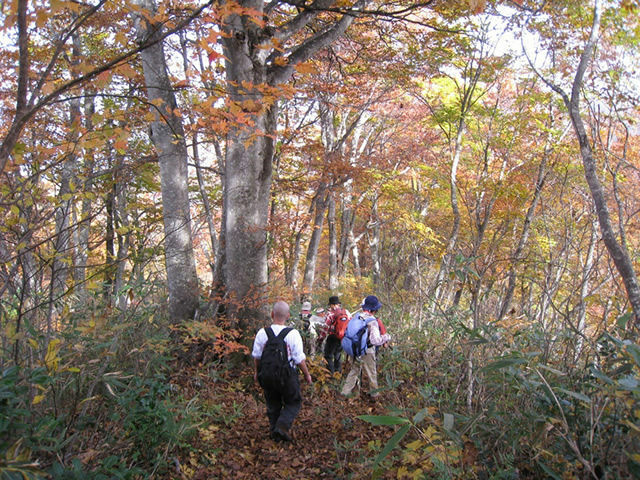 On October 19, event participants can participate in a one-hour hike in Gokayama, a lesson on Doshumichi and trail running, and a dinner party. On October 20, runners divide into groups led by guides and run the Doshumichi. Next year’s main event will be a timed race, but this year’s run is not timed. Visitors also have a variety of sightseeing opportunities. The main gate of Gyotokuji Temple has an unusual thatched roof. The adjacent Doshu Itoku Kan houses treasured items associated with Rennyo and Doshu. Next to Gyotokuji is the Iwase family residence, a 300-year-old house that is the largest gassho-style house in Gokayama and nationally recognized as an Important Cultural Property. Suganuma itself is a very small riverside village of only nine houses, but has two museums and opportunities to taste life in traditional Japan.